the relationship of the long axis of the fetus to that of the mother; see also presentation. longitudinal lie a situation in which the long axis of the fetus is parallel to that of the mother; in presentation, either the head or breech presents first. oblique lie a situation in which the long axis of the fetal body crosses that of the maternal body at an angle close to 45 degrees; in presentation, the shoulder usually presents first, but the arm or part of the trunk may also come first. 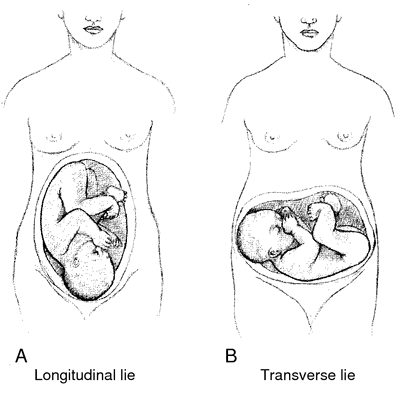 transverse lie a situation in which the long axis of the fetus is transverse to that of the mother; see illustration. Relationship of the long axis of the fetus to that of the mother. Compare: fetal habitus. (li) the relation of the long axis of the fetus with respect to that of the mother; cf. presentation and position. oblique lie the situation during labor when the long axis of the fetal body crosses the long axis of the maternal body at an angle close to 45 degrees. transverse lie the situation during labor when the long axis of the fetus crosses the long axis of the mother. the relationship between the long axis of the fetus and the long axis of the mother. In a longitudinal lie the fetus is lying lengthwise, or vertically, in the uterus, whereas in a transverse lie the fetus is lying crosswise, or horizontally. Relationship of the long axis of the fetus to that of the mother. The position or attitude of the fetus in the womb in relation to the long axis of the mother's body. Lie may be longitudinal (normal) or transverse. Q. Hello I have a problem here.Can alcoholism make you lie and cheat? Hello I have a problem here. I have a baby through a married man. He claims that he was not in his senses due to alcohol and that’s how I got pregnant. Can alcoholism make you lie and cheat? He will continue to lie and cheat for the rest of his life. I don't think he'll want to be cured. Do you really want to live with someone like that? Are you going to tell your baby that his daddy is allowed to lie and cheat? A. Dear Saloni. I wish you had not got into this situation. Extreme desperation is filling you with a very foolish hope. If you had your head together then you'd know damn well that this guy is a scumbag unworthy of your time. This guy already has two women too many, while on the other side of town there are good men who are all alone. Get away from him now! A. the battle against your own self is harsh and there will be casualties. reality is based on your own definition of the world around you, but it also based on how the world defines you. this is your escape from the inner struggle- define yourself and your actions not by your own faulty judgment but by how the world and it's moral judge you. Q. Having chronic headaches, start in base of neck and progresses to migraine, worse when lying on stomach. Why? I have been having chronic headaches for the past 2 weeks. They start in the base of my neck and become migraines. They intensify when I lay on my stomach, blood rushes and they throb. Sometimes I can give myself relief by pressing firmly on my head or keeping my neck in a certain position. Just wondering if anyone knows what might be causing them. A. Pinched nerve, bad posture is my problem anyway. I have a pinched nerve in my neck and my posture is horrible which causes me to get the worst headaches and they always start at the base of the neck and I always thought I had great posture (set up straight and all), but I was soooo wrong. Check with a Doctor and seek help from a Chiropractor if possible. They can do wonders. But for now, try lying on your back with a pillow or towel rolled up and placed under your neck only. It will support your neck and give it a nice crack too that helps a good deal too. That also helps keep the headaches away. Do you get sick to your stomach when the headaches come on?